On Saturday, January 29, at the San Francisco State University Downtown Campus, Julie Burns presented a workshop on how to get started as interpreters and discussed the tools and resources necessary to succeed in the profession. She also provided the participants with a general survey of the status of the trade. Julie is a well-known interpreter trainer, California Worker’s Compensation Certified Spanish interpreter, and ATA-certified translator. She provides professional trainings to prepare bilingual individuals to work as interpreters in hospital and clinic settings, and offers continuing education workshops for linguists’ professional development and stress management. 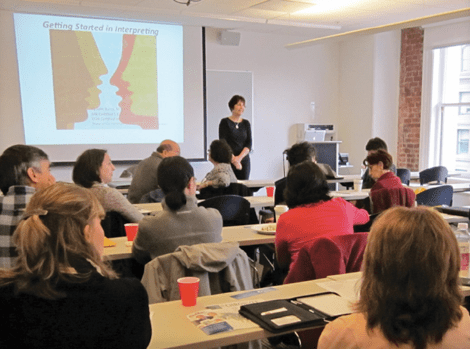 There were 21 people at this four-hour workshop; among them were two representatives of Accent on Languages, a translating/interpreting agency in Berkeley, interested in recruiting new interpreters for its roster of linguists. The first point that Julie covered was the difference between interpreting and translating: how the nature of translations is permanent while interpreters work out of the fleeting moment (verba volant, scripta manent). She also explained that both types of linguists require a certain level of proficiency, with additional listening skills that are a prerequisite for interpreters. Translators often work in teams and might need to engage in substantial amounts of research, while the interpreter needs to obtain the information ahead of time in order to prepare for the assignment. The concept of “register” was introduced, which refers to the level of formal or complex language a person chooses to use (for example, the high register of a well-educated speaker vs. the lower register of everyday speech). Julie explained how the interpreter needs to adjust his/her wording to reflect the register used by the speaker. Julie noted that interpreters have multiple roles in the community and can act as Advocate (oftentimes in healthcare settings), Culture Broker, Clarifier (being transparent and adjusting register), and Conduit (speaking in the first person: “I have a headache” as opposed to “He is saying that he has a headache”). She also listed and clarified the different modes of interpretation (consecutive, simultaneous, and sight translation) and the various professional settings (community, health care, legal, and conference interpreting). Julie explained how an interpreter is required to possess and use a wide range of skills, qualifications, and decision-making abilities; basic bilingual proficiency is not sufficient to enter the profession. She showed a slide of the proficiency assessment chart of “The Language Testing International” (an organization that arranges language assessments in 60+ languages for corporations, government agencies, academic institutions, and individuals) with the four levels of expertise: Novice, Intermediate, Advanced, and Superior. Julie clarified that the Advanced Level represents the minimum requirement for a professional interpreter. Julie highlighted the importance of active listening and short term memory for interpreters, and suggested that we divide into pairs to practice this skill. Two short passages were read by the instructor about a funny ER home intervention and a village in Italy; then, we all took turns repeating to our partner what we remembered of the piece read. Some of the tools to improve one’s own capacity to retain information are: visualizing (making a mental picture of something specific that the speaker just said), and echoing (repeating silently a phrase or number to oneself). At the end of the workshop, Julie allocated some time to allow participants to ask questions and obtain answers. Nina posted this article under Getting Started, Interpretation, NCTA Events	on Sunday, May 1st, 2011 at 12:07 pm	You can follow any responses to this entry through the RSS 2.0 feed. Both comments and pings are currently closed.